Provides lasting relief of back and neck pain. Treatments are comfortable and relaxing. Treatments are administered with patients fully clothed. Some patients may experience some mild muscular soreness after a treatment session, similar to a muscle ache you may feel after a good workout. 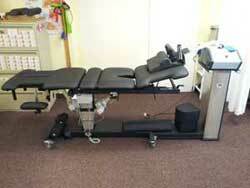 Patient customized & specific spinal decompression therapy. We will decide if you’re a candidate for spinal decompression. We address the source of the pain (the disc) that is causing the problem, correcting the problem at its source. Our traction-based spinal decompression treatments are designed to decrease the pressure in the involved disc(s) allowing an influx of blood and nutrients into the injured tissue, speeding up your healing time. Understanding the cause of your back pain is the very key to receiving the appropriate treatment. Creates a negative pressure, a sucking pressure in the disc which tends to pull the herniated / protruding material back into the disc. Promotes the movement of H2O, O2 and nutrients back into the disc, rehydrates the disc, which helping the disc to heal more properly. Takes pressure off the spinal nerves, reliving the pain and healing begins. Depending on the severity of the condition. On average, a patient is advised to undergo approximately twenty treatment sessions. Each session of spinal decompression therapy lasts approximately 10-15 minutes. Most injured spinal discs often never fully heal due to constant wear and tear they undergo during normal daily activities. 0% of people over the age of 30 will experience back pain at some point in their life. 30% of those will have reoccurring problems. At any given time almost 15% of any given population will be suffering from back pain. Back pain accounts for almost ¼ of all occupational injuries and illnesses. Increase in intra-discal pressure is almost always related to an increased chance of discogenic pain. When left untreated, discogenic back pain can progress until it becomes a herniated disc. The difference between normal lumbar discs and degenerative lumbar discs is the level of hydration. As we age the disc dehydrates and becomes brittle and is prone to injury. Spinal Decompression lowers pressure in the disc and increases diffusion of nutrients and blood through the end plates of the vertebrae. usually occurs in the neck and lower back. is a common cause of back pain. may occur suddenly in the event such as a fall or an accident. may occur gradually with repetitive straining. may occur even just normal use of the spine. As the spinal discs becomes less elastic, they can eventually tear and rupture. When the disc ruptures, (is compressed) a portion of the spinal disc pushes outside its normal boundary (exerts pressure) into the spinal nerve root, this is called a herniated disc. Often people who experience a herniated disc have already experienced some level of discogenic pain and may have ignored it or not sought proper treatment. Discogenic Back Pain and a Herniated Lumbar Disc are serious complications of our modern life, they can be treated successfully. loss of disc height caused the vertebral bodies to be more compressed. excessive spinal compression causes the surrounding nerves to be constricted leading to the onset of back pain. decompression therapy can help reduce the pressure on the degenerated disc alleviating the pain. facet syndrome is occurs due to arthritic changes around the vertebral bones, which can cause severe back pain. since facet syndrome is not a result of disc compression, spinal decompression therapy is recommended to increase space in between the vertebral bones, reducing pain. one of the most common causes of lower back pain. patients may or may not remember the initial event that triggered their muscle spasm. causes back pain the aging population. the spinal canal becomes constricted due to in part to arthritis and other conditions. back pain results of nerves becoming inflamed from constant irritation. an affect any joint in the body including the spine. is due to degenerative changes causing loss of normal stabilizing structures of the spinal column. Stretch: always warm up and stretch after you perform physical activity. Avoid Bad Posture: Poor posture is responsible for increased and abnormal loading of the spine and can result in increased disc pressure. Correct Ergonomics at work: Incorporating proper ergonomics while sitting behind your desk or while engaging in physical activity will help avoid future back injury. Protect Yourself: If you do physical work, wear the correct protective supports. Maintenance Therapy: Properly maintaining your health is the only true way to avoid future recurrences of your back pain.